While the patent application does not refer to the <!---->HomePod<!----> by name, it describes a voice-controlled assistant device such as a "countertop speaker" with various sensors and cameras that "gather hand gestures and other three-dimensional gesture input." This could include waving, clapping, and so forth. Interestingly, the <!---->HomePod<!----> could have LEDs woven into the fabric to provide visual feedback for the hand gestures. The LEDs could also be configured to display alphanumeric characters through the fabric that change depending on time of day. 3D hand gesture support on the <!---->HomePod<!----> could utilize technology Apple gained from its acquisition of PrimeSense in 2013. In 2016, for example, Apple filed a patent for hand gestures on the Mac such as push, up, and wave that could be used to perform basic app interactions like scrolling through a menu. Examples of unlock gestures include an "up" gesture (e.g., raising hand 30 a specified distance), a sequence of two sequential wave gestures, and a sequence of two sequential push gestures, as described in detail hereinbelow. PrimeSense's technologies were initially used by Microsoft for its Kinect motion sensor for Xbox. Apple later incorporated some of the technologies into the TrueDepth system that powers Face ID on the iPhone X and newer. As for Face ID, the patent explains that the <!---->HomePod<!----> could identify users in the vicinity of the speaker using "facial recognition," as well as measure the distance of users to the speaker. 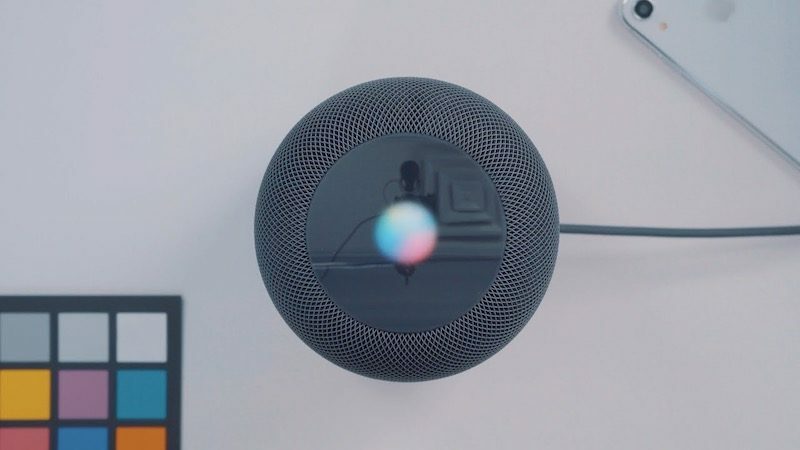 This could allow for biometric authentication of Personal Requests, multiple user profiles, and more on a future <!---->HomePod<!---->. In late 2017, the president of Apple supplier Inventec said his company sees a trend towards both facial and image recognition technology being incorporated into smart speakers, without specifying which speakers in particular. This led Apple analyst Jeff Pu to predict the launch of a Face ID-enabled HomePod in 2019. The exhaustive patent goes on to describe a variety of other potential features for a future <!---->HomePod<!---->, such as ambient light sensing, displaying a sunshine icon if sunny weather is forecast, displaying the logo of a sports team that wins a game, heart rate sensing, and much more. One quirky feature mentioned is an emoji-based avatar that would adapt to a user's mood or actions. If the user is sad, for example, the emoji may reflect sadness. Or, if a user asks the <!---->HomePod<!----> for information on purchasing a birthday gift, the speaker may display a happy emoji to present results. The patent application was filed with the U.S. Patent and Trademark Office in July 2017, six months prior to the launch of the current <!---->HomePod<!---->, but it was only published in late January due to a standard 18-month confidentiality period.